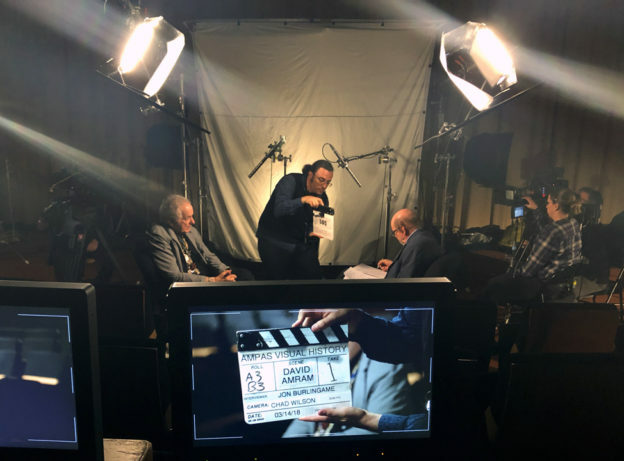 The extraordinary composer David Amram was in town this week, so the Academy of Motion Picture Arts & Sciences and the Film Music Foundation took advantage of his presence to add him to their Visual History archives. I was asked to conduct the interview, which meant an intense research weekend immersing myself in his films (among them The Manchurian Candidate, Splendor in the Grass and The Young Savages), re-reading his autobiography, and listening to as much of his music as possible. It may be a while before the interview is available for viewing, but rest assured he talks about Elia Kazan, John Frankenheimer, Jack Kerouac, Leonard Bernstein, Charlie Parker, and many of the other amazing people with whom he has crossed paths over his 87 years. This entry was posted in and tagged Academy Visual History program, David Amram, Elia Kazan, Film Music Foundation, John Frankenheimer, Manchurian Candidate, Splendor in the Grass, Young Savages on March 15, 2018 by Jon Burlingame.